Though I am a regular bike commuter, the longest ride I had done was 26 miles. I did that ride on my birthday last year. The goal was to ride 41 Km for my 41 years of life. But, I had a couple of detours and ended up with 42 Km which is about 26 miles. It was time to take another long ride. There were no plans to make this a fast ride. The point was to enjoy a day on the bike; not to go out there and try to ride my tires or legs into the ground. The trip was planned for Good Friday. Theoretically this would give me a day on the road with fewer cars. The town I was riding to is a place I had never been before and since we don’t own a car I did not have a chance to drive the route to even see what the road was like. I was going on blind faith that some friends told me the road was fairly good. Even though it is just a two-lane road there normally wasn’t too much traffic. From what I knew of the area, once I left my town I would not have any services until I got to the town where I was to turn around and come home. I rode from La Plata to Magdalena, Buenos Aires, Argentina. The only thing I would see would be farms, cows and a little water. I knew the ride would be a total of 65 to 70 miles. I know that is not a traditional century ride, but since I live in a country that uses the metric system, I decided to bend the rules a little and count 100 Km as my century instead of 100 miles. My backpack held all my supplies. In the bag I took a camera, not that it did me much good. I only took a couple of pictures. I also carried an extra bike tube (though it had holes in it) and a pump. Inside my water bottle cage sat my big bottle of water. I also had a few light snacks in the backpack. I planned to eat in Magdalena before returning to La Plata. Or, if I found some interesting place along the way, I would think about giving it a try. So I carried some extra cash with me. One of the pieces of equipment I have come to love is my glasses mounted bike mirror. I wasn’t too far from home when I realized I got away from the house without it. But, I figured since there should not be too much traffic that I might not need it. I live on the west side of La Plata which means that I needed to cross town to really get started on the ride. It normally takes me about 20 minutes to ride to the middle of town. Because there was no traffic that Friday morning, I was able to get all the way to the other side of town in about 25 minutes. I destroyed my rear tube a couple of days before the ride, so I was riding on a spare of the wrong size. Even though it was an official day off, I was hoping to see a bike shop along my route where I could pick up a couple of patches. I had run out earlier in the week. Fortunately I found one over on Calle 122 as I was riding through the Berisso part of town. The trip out to Magdalena was peaceful. I did not have too much traffic. At times it seemed constant, but it never felt like there were cars piled on each other trying to pass on the narrow road. I never felt unsafe. At times I missed my bicycle mirror; however, I don’t regret leaving it behind. I really don’t think it was necessary. The road was pretty rough for maybe the first 15 to 20 kilometers out of town (10 to 13 miles). After that it smoothed out some. 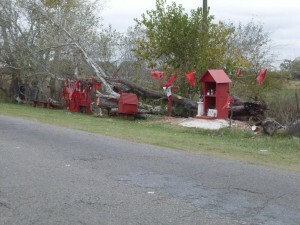 This was not much of a problem on my way to Magdalena. My legs were fresh. My bottom hadn’t been beaten too badly by this point, so there was no soreness to worry about on the rough road. The route was pretty much what I expected. There were very few people and houses along the way. While there were cars that could have helped me if I got in trouble, there really were no places to pull over and use a phone or buy some food until I got close to Magdalena (the turn-around spot). Roadside memorial to people who died in a car accident. 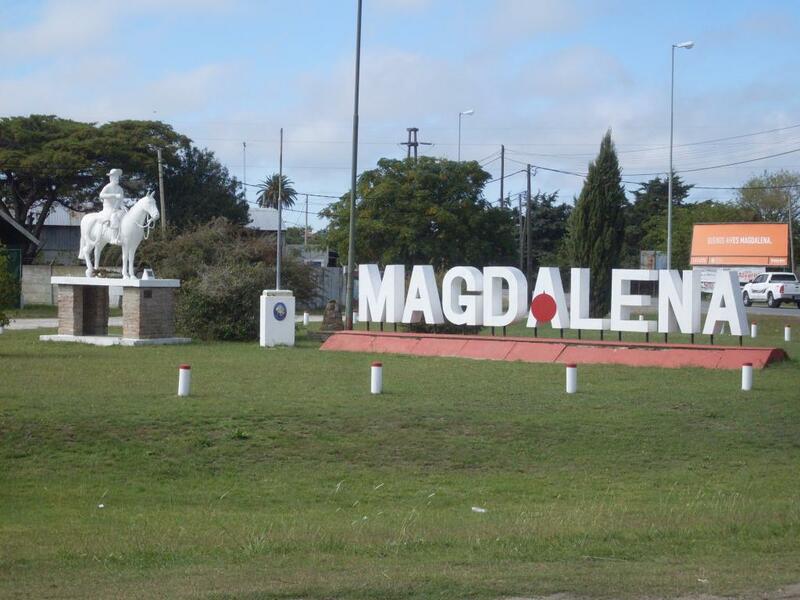 As I rolled into Magdalena I was a little surprised to see how big of a town it is. Looking at Google Maps for the town makes you think it was just a dot on the side of the road. However, Open Street Maps for Magdalena shows that it is much more developed. I rode most of the way through town until I thought I had seen a good portion of it—at least enough to justify riding my bike that far. There was a nice little corner supermarket that I jumped into to buy some food. I walked out with a bag of cookies, an apple and a bottle of Gatorade. Sitting in the window seal of the store I ate my lunch. I spent about 25 minutes eating and taking a break. It took me almost 2 and 1/2 hours to get to Magdalena. With my lunch break and another stop before leaving town, I knew it would be a 6 hour day before I was home again. The only thing I was concerned about was there was a forecast of rain for the afternoon and evening. I wanted to get home before I got too wet. About 20 Km outside of Magdalena the road had been recently resurfaced. It was glassy smooth. I didn’t really notice how nice it was going into and out of town. Looking back, that section was heavenly. Remember the rough rode coming out of La Plata I mentioned earlier? Now it was time to ride through that again. Except this time I had been sitting on a bike seat for 4 hours having covered about 45 miles. My backside was starting to get a little sore by this point. Besides my sitter-downer being tender, by the time I got back to town I was getting a bit hungry and running really low on anything to drink. I had a $100 peso bill (about $25 USD) with me, but most smaller stores don’t have change. If I stopped in to buy anything it would be less than $10 pesos. Besides, it was 3:00 in the afternoon when I got back to La Plata. On top of it being a holiday, almost all neighborhood stores close between 1:00 and 4:00 each day. I would not get to a larger supermarket until I was within 1 mile of my house. It hardly seemed worth the time to walk into a store to buy food and drink when I could finish the ride to my house and have all the food and water I could consume. So I pushed on to the house. By the time I got home I was running pretty thin on water and food. But, I made it home safely. The ride took 5:59:56—just 4 seconds short of 6 hours. That includes the time I took off for lunch. The total distance for the trip was 68.2 miles (109.8 Km). According to my notes, I averaged 12.1 MPH for the trip (excluding my lunch break). I thought that was pretty good for a ride that was not meant to be fast. The weather was beautiful. It was 65 and overcast almost all day. It never rained while I was on my trip. But when I arrived home I got cleaned up and had a short nap before heading off to work. During my nap there was a little rain that fell. There were two known problems with my bike going into the ride. One is that I knew my bottom bracket needed an adjustment. Because I didn’t think I had the tools available to me to make the tweaks, I ignored the problem. Fortunately it ended up not being an issue and I was able to adjust it after the ride. The bigger problem was my rear hub needed new bearings and cones. By the end of the ride I was thankful I made it home. They were pretty bad. I didn’t have any problem with my tube and ended up not needing the patches or pump that I took with me. I am still glad I carried it all though. Though my first really long ride was tough, it showed me some things I need to prepare for when I do a real century ride. I need to spend a little more time with my bike getting it prepped for the trip. I also need to plan more food and drink. Or, at least take smaller bills so that I could buy from any roadside stand if I needed something. Have you done a century ride? Leave a comment and tell me about it.